I took a trip out to Sunburst Farmers Market on Saturday, on a tip from Liz Paulk. The market is fairly straightforward to get to--drive east on 82nd, past the loop, until you get to MLK. Turn south, and you see a sign for it almost immediately. When I arrived, there was a lot of business, with cars coming and going along the dirt road leading to the market. 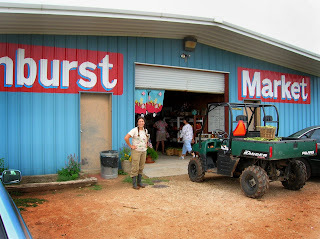 The market itself is in a largish corrugated metal building (which neighbor Upe, an architect, would say is part of the architectural vernacular of west Texas), painted a cheerful blue. Inside, the space is a bit cramped, but it certainly has a nice selection of different things, including fresh produce, local eggs, honey, canned goods, and baked goods. 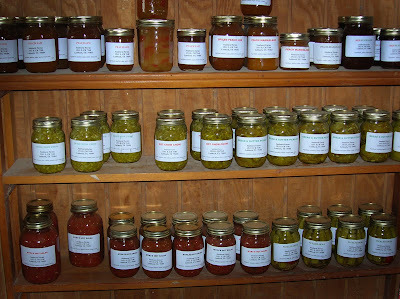 Some of the produced that I noted included green beans, several kinds of peppers, potatoes, okra, tomatoes, and eggplant. Oh, and melons, of course, which are everywhere in abundance right now. I'm sure there were even more produce items, but I was too excited by the baked goods and eggs to pay attention--I mean, vegetables versus banana bread? Come on! Just look at it here! Which would catch your eye? 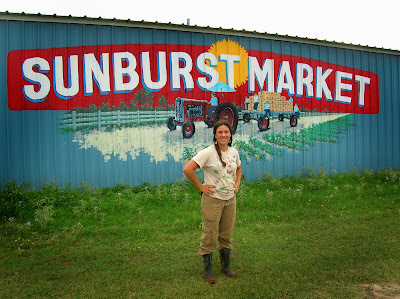 I spoke briefly with one of the owners, Amy Jones (seen here in this photo below), and learned that the market is really part of Sunburst Farms, so this is about as close as you can get to picking it yourself. Amy pointed me to a website, localharvest.org, that is a clearinghouse for sustainably grown food. Here is a link to the page on Sunburst Farms. Amy has degrees in agriculture, and an interest in working with people who are interested in gardening, so my sense is that she would be a good resource. Her contact info is on the Local Harvest site. 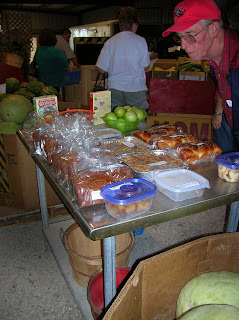 My overall impression of the market was that it was clean, friendly, and had a large turnover of goods. It would be possible to get there by bicycle, but probably not a lot of fun, owing to the distance. Traffic along 82nd doesn't seem especially bad, however. A better option might be to carpool. Thanks for doing the homework for us, Susan. This looks like it's worth a visit. Maybe we can carpool or something.